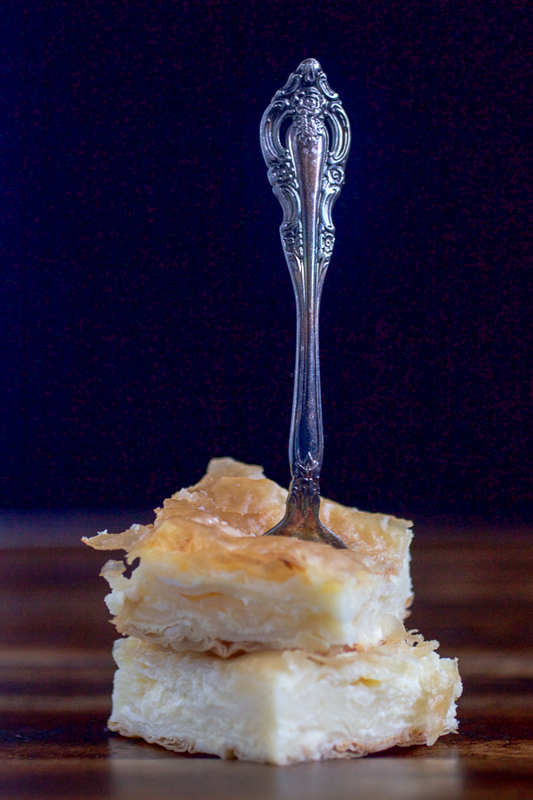 Phyllo cheese pie is a layered, 60 min, quiche-like, one-pan dish belonging to the family of Balkan pies. It’s made by stuffing phyllo dough with a mixture of cheeses and eggs. Today’s phyllo cheese pie comes on the heels of other pie recipes. We’ve covered a few by now. There is the ultimate green spinach pie, and the ground beef and potato pie, both of which can be made with phyllo from the store. 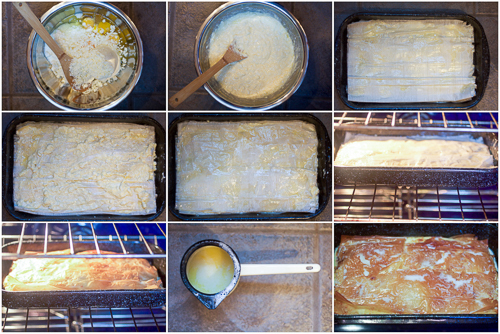 Not to leave a stone unturned, we’ve also explored making phyllo from scratch when we made the potato pie. Out of all the pies we’ve made and will be making, phyllo cheese pie is the easiest. What it is, is just a pound of phyllo from a box, stuffed with a filling made with cheese(s), sour cream, and eggs. To give it the softness, each phyllo sheet is dabbed with a little bit of oil before the stuffing is smeared on. When all the layers are complete the pie is baked in a very hot oven. The finish comes in a form of a little bit of milk sprayed over the whole thing. And there you are. A dinner in an hour or so. You’ll be ahead on time if you get the cooking spray (aka oil in a spray can). Unfortunately these haven’t made their way to the Balkans yet. I don’t want to think about what kind of processing makes oil work from a can, but this innovative packaging sure makes the layering go fast. 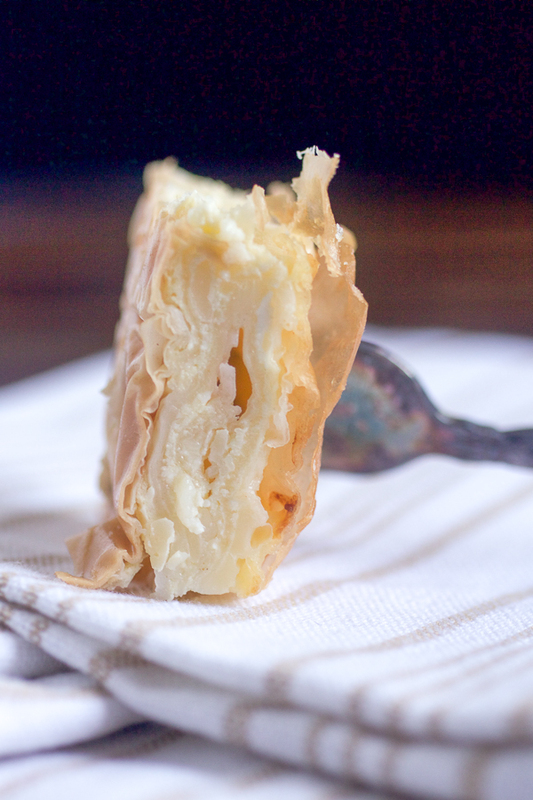 Phyllo cheese pie is what you should bring to a party next time someone asks you for a casserole. It’s a great breakfast, lunch or dinner. Add a couple of sides (a soup and a tomato salad), or eat it just how it is. It’ll fill you up. Now on to the cheese. When I’m in the Balkans, I complain about things like cooking spray. When I’m in the US, I complain about the cheese. 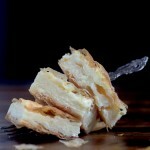 The best phyllo cheese pie is made with unpasteurized soft cow cheese. Cow cheese is soft, pliant and mild. A sensible undertone to feta, or another stronger cheese you choose to combine it with. Unfortunately it’s easier to buy a cow than to find unpasteurized cow cheese in the US, so you’ll have to make other choices. Ricotta is a solid alternative. Cottage cheese works also. As for the stronger and harder cheeses, play with them until you find your own winning combo. From the comments below you can see people even use gorgonzola. Don’t worry about making a mistake here. 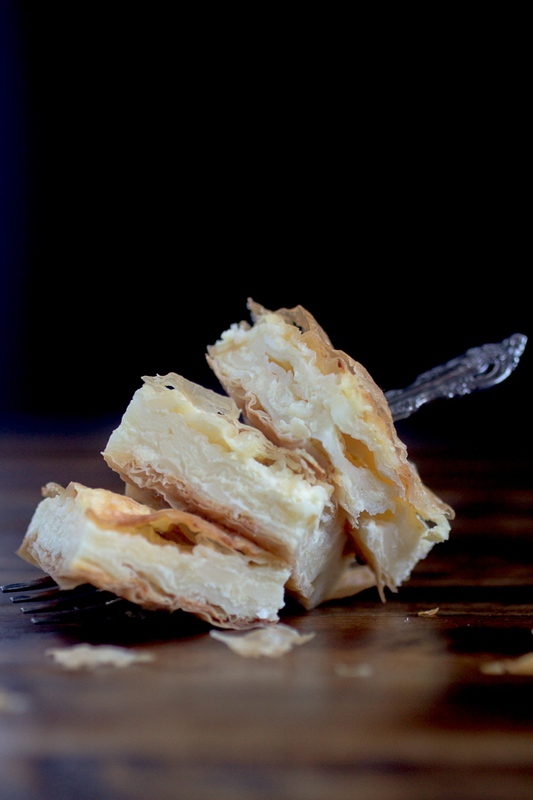 Phyllo cheese pie is about what you like. Get creative. And if you’re up for it, leave a comment below and let me know what cheese you used! Combine cheeses, eggs, sour cream and salt in a large bowl and whisk until integrated. Grab a generous amount of the filling (about 4-5 tablespoons) and spread evenly over the top sheet. Layer 1 sheet on top of the filling, and brush (spray) each sheet with oil before adding the next layer. Repeat until you run out of the filling and phyllo, making sure to leave 2 sheets for the top of the pie. Take the pie out of the oven and spray with milk (optionally you can add butter to milk). Leave to cool for 15 minutes. Fear of bacterial infection maybe? But I’ve never in my life heard of anyone who died from cheese. Thanks for stopping by Marko, and sorry about the metrics. 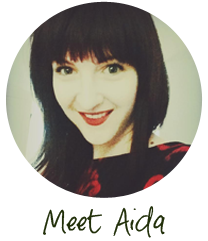 I’m slowly translating the recipes into Bosnian and will be using metrics in translations. But you got me thinking – I should include a measuring chart somewhere on the blog. Small amounts of Gorgonzola or blue added are a fun non traditional variation. I like a pinch of cayenne and sometimes even some shredded green cabbage and potato for a Krum/sirnica hybrid. My wife likes it when I add feta to Burek, again not very traditional. Sirnica with cayenne and Gorgonzola? Adventurous, I like it! Feta is always a good, safe option. But not a bad idea to mix it up with cheeses, sour cream, etc. Keep up the awesome work, Aida! So many countries, whose language I don’t speak, have so many of the types of recipes that I think I’d love. It’s great to find another, this will go on the list of things I have to make. I hope you do, and I hope you like it. This one is a good intro into Balkan food, and you can play around with different cheeses for a taste of your own. Bon appetite! Thanks for this, because I ask my mom how to make it and she always gives me “odoka” recipe like others have said. Although, she never makes the cheese pie with feta, she uses cottage cheese which I think probably gives it a milder flavor and is closer to the “mladi sir” traditionally used for this recipe. Then she uses cream cheese instead of ricotta, but does use some sour cream. I made it that way and it was awesome. It really is the simplest recipe around. Glad the recipe worked out! You can experiment with cheeses. I like the feta combo as it gives it a more salty flavor. There is no wrong way to do this.